That's a low estimate of how much friction and wear costs the U.S. every year. In fact, studies suggest that so-called "normal wear and tear" costs industrialized countries some 2 to 6 percent of their annual gross domestic product. How so? Nearly every machine ever created has at least one performance-critical sliding interface. Joints, bushings and bearings must operate reliably with low friction and low wear or the machine to perform as desired. When parts wear out, materials are wasted, quality suffers, and downtime and replacement expenses accrue on a massive scale, across all industry and consumer sectors. Apologies to William Shakespeare, but...ay, there's the rub. Dr. Brandon Krick is a tribologist - an expert in the study of the effects of friction on moving machine parts, and methods of easing those effects. "Tribology is absolutely integrated with everything we do daily, yet it is very poorly understood," he says. "The fact is that nothing - nothing -- would work without friction." Professor Krick is partnering with colleagues from DuPont on a project that's recently won a "GOALI" grant from the National Science Foundation (NSF). 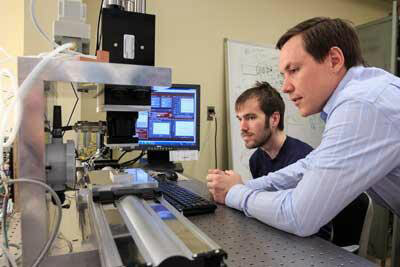 The intent is to expand the Lehigh Tribology Lab's fight against friction, its war on wear. A 2013 addition to the mechanical engineering faculty at Lehigh University, Krick studies the fundamental origins of friction, wear, materials deformation, and adhesion on complex surfaces ranging from cells to nanocomposites, in environments ranging from space to thousands of feet under water. The NSF's Grant Opportunities for Academic Liaison with Industry (GOALI) program promotes university-industry partnerships by making project funds or fellowships/traineeships available to support an eclectic mix of industry-university linkages. According to the NSF Web site, special consideration is provided to interdisciplinary projects that create opportunities for faculty, postdoctoral researchers, and students to conduct research and gain experience in an industrial setting, while enabling industrial scientists and engineers to bring their perspective and skills to academia. Professor Krick says that the Lehigh-DuPont team will develop and study ultralow-wear composite materials suitable for manufacturability and usage in commercial and industrial settings. Krick will serve as principal investigator on the project, with DuPont scientists Christopher Junk and Gregory Blackman serving as co-principal investigators and Lehigh graduate student Mark Sidebottom leading the experimental efforts. "We'll be exploring how various material structures, composition, processing and operating conditions impact tribological performance," Krick reports. "We'll also gain a much more complete understanding of the mechanical and chemical processes involved in wearing down materials we're developing." "Working on this NSF GOALI proposal has been a truly collaborative, multidisciplinary process that could not have been completed without the help of our talented team members," say DuPont collaborators Junk and Blackman. "This project will focus on very fundamental questions, but with real applications in mind. Being on this team with Professor Krick has made us all better scientists and engineers, and we are eager to continue to build our partnership and help train new researchers along the way." According to the grant materials, "the research will use student-built instruments to directly validate the hypothesized mechanism that in situ tribochemical reaction products alter the properties of otherwise inert fluoropolymers. A multi-faceted characterization approach will systematically test the hypotheses and discover new mechanisms of these materials that could, ultimately, enable science-based design of new materials that are incredibly resistant to wear." The grant also calls for the development of outreach programs and educational opportunities in the field of tribology. Krick and his colleagues at DuPont have been partners fighting wear for several years. DuPont supported much of Krick's work as a student and researcher at the University of Florida, and the relationship has carried over into his activities at Lehigh. "DuPont is one of the world's premier industrial scientific communities," says Krick. "Working with the DuPont team has been one of the most productive and rewarding collaborations of my life." Krick was attracted to Lehigh due to its intense focus on interdisciplinary education and research and the power of its material characterization facility - the Center for Advanced Materials and Nanotechnology. "I'm in this field that relies heavily on collaboration, and I saw a lot of talented students and faculty here, and research capabilities that are right in my wheelhouse - the right place to build a research program," he says. Krick feels that the study of tribology gets far less credit than it deserves. "Lately there has been a large push for green manufacturing, new sources of energy, ways to make things more efficient. With tribology, we can make machines work more efficiently, significantly improving energy and material usage. If we can reduce the energy demands of machines and devices, we make use of alternative energy sources much more feasible."